I finally uploaded more videos we taken since Amelia's birthday last month. Each is linked to You Tube. I also made a fun outfit out of the fabric Miekka found for me. I've craved this fabric for about a year!! I am so glad there is still a yard and change left to play with. I made another ruffle-y skirt that is super cute! Now I am out of shirts and orders, so maybe the sewing will calm down a bit. Mia has three official chores! 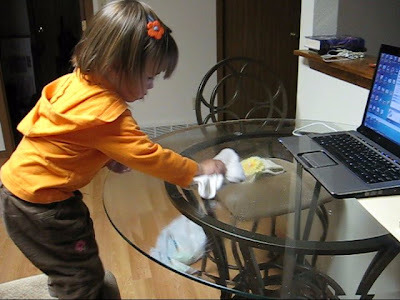 Her favorite chore is to clean the glass table with a rag and windex. I could spray the table 40 times and she wipe it 40 times and she would be happy as a lark. I love it! She also stands on her little stool and puts away the silverware. Her newest chore is helping Daddy clean the potty. This is part of her potty training regime. We are a long ways away but anything to get us closer is awesome. An unofficial chore she made for her self is to go through at least 3 outfits per day. Saturday she made mud pies in the gutter for 20 minutes. I love to let her do things that will develop her motor skills. Dirty is no problem now that we have a washer and dryer!! Milestone: today she actually said part of the prayer, repeating phrases Justin dictated! She was just muttering her own prayers. I about melted!! We had so much fun today! The Haley's invited us over for a mountain man breakfast, which consisted of sausage, hash browns, eggs, bell peppers, etc cooked in a dutch oven. It was super yummy and very filling. I was not hungry all day long. Morley celebrated his 10th birthday so we were able to watch him open family gifts. 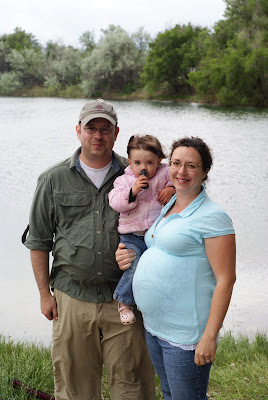 Then we went back home and packed up the car for another day excursion to Bridgeport Lakes. Matt found a lovely spot near the swimming beach, perfect for fishing and getting dirty. The girls immediately found sticks to write in the dirt with. Ella fell into the pond within 5 minutes of getting there. SOOOOO, Alison and I took the girls over to the swimming beach to throw sand and sticks into. First, we rolled up their pants. Then took the pants off. THEN, just let the girls get soaking wet. They had a blast. Mia kept muttering to herself, "I not cold!" She stayed in about 10 minutes longer than Ella. 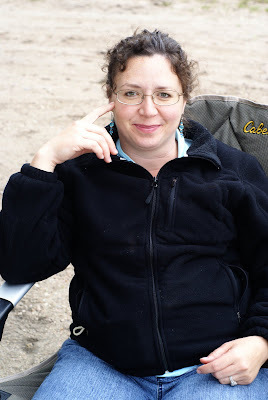 Me, I enjoyed using the manual mode on my camera to capture some fun images of our day. After swimming Justin held Mia in her towel for a snack and drink break. The boys entertained themselves with two shovels and one large/deep hole. Justin was in the thick of all the digging. Soon Mia and Ella joined in the fun. Drew was often seen with only his bum sticking out of the hole. I made sandwiches, chips, and fruit for lunch. It was a hard lunch to make!! Those chips take forever to make...the fruit, even longer. The girls were still pretty cold so I spent a while in the tent Justin set up to warm up outside of the wind. We played "running around Mommy" an exciting game consisting of eating chips and running circles around me, often tripping on my feet. They warmed up beautifully!! The boys caught a dead catfish, which they proceeded to disembowel, char over the fire, and dare each other to eat. I am excited that soon our boy will enter the fray. Even Ella dared to bite several live minnows held in the bait box. It was hilarious to see a wilding flipping tail hanging out of her mouth. She definitely has three brothers. Mia, would not even look at the fish. The kids proceeded to get very dirty. Mia found a water bottle to stuff dirt and rocks into, after which she tried to drink the contents. After each bite of rock she would exclaim, "Yummy!" Soon she had a true mud goatee and dirty toes to match. I spent most of the time with my precious camera practicing shooting in manual mode (yes, I HAD to mention that again). The weather cooled down considerably around 4:30 so we packed up and headed back home. Less than 20 miles outside of Sidney the rain started to come down in a vengeance. We are glad we went north instead of south. For the most part we avoided all the forecasted rain. The best part about playing in the dirt is taking a shower afterwards! That was delicious. Now all we need is a good night's rest. We planned on going camping this weekend with Matt and Alison, but the weather forcasted 60% chance of rain today and tomorrow. As I write this the rain is coming down swift and hard accented with thunder and lightening. Glad we aren't in the mud!! 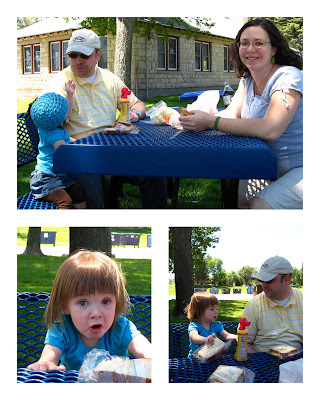 So instead we went on a picnic of sorts to use the food we already purchased and prepared. Last night I cooked our foil dinners so we wouldn't have crunchy carrots. After church we drove first to a Mountain Man festival several ward members were participating in. Justin shot a black powder rifle and hit the 120 yard target. I nearly had a chance but a rifle shooting contest started up. We looked at all the period tents and clothing. Reminded me of the Logan, UT Mountain Man festival. Then we drove 10 minutes north to Bridgeport where there is a State Park. I think Matt said there are three or four different lakes each boasting a different type of fish (trout, bass, etc). The boys pulled out their fishing poles while Justin and Matt started a fire. We dined on our foil dinners then made s'mores with marshmellows and fudge/PB cookies. The girls had a blast making silly faces and being cute. Tomorrow we will eat breakfast early then head back to the same place for a day of fishing and fun. Hopefully, the weather will improve a bit so the girls can get wet in the lake. I've been feeling extremely tired lately. I normally take a 10-15 minute nap each day. Friday and Saturday I napped over 3 hours. Strange! Plus my voice is hoarse sounding which makes it seem I am sick. Just tired, really. We enjoyed the good company and fresh air of the day. However, the best part of our day was watching the Music and Spoken Word this morning. I really loved the rousing music played for our Veteran's. It was so inspiring and helpful to ponder on our military force due to the program's message. Having four members of my family serving in the military is such a blessing. Thanks guys!! 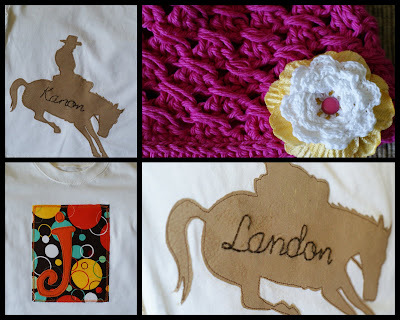 So not only has crafting occupied my week but other fun activities! The best was finding the CUTEST shoes at Walmart. I had to buy the yellow and orange pairs, modeled by me with a shoe per foot. Aren't they super cute? I almost slept in them last night. Amelia and I went shopping at Walmart three times this week and once to Safeway. I kept finding things to return or exchange to Walmart to complete my projects. The weather was really warm Monday through Wednesday, hovering in the upper 80's. 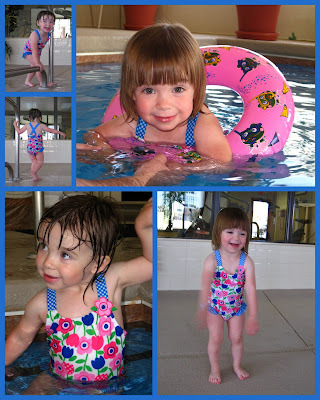 Amelia practically lived in her swim suit for the three days. The experience was really good for potty training because Amelia would watch her pee come out and finally made the connection what we were asking her to put into the potty. Unfortunately, that also meant she pooed in her swimsuit too. It was super gross. She went around saying how gross her bum was for a couple hours. I potted more plants with the seed starts I've babied. We played at Alison's or vice versa everyday. The girls are playing so nicely. 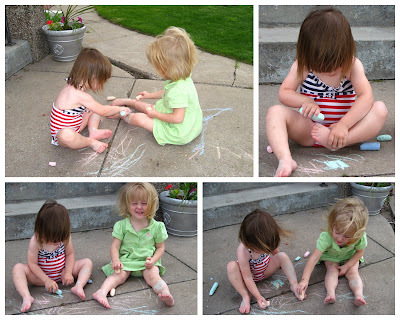 Yesterday they were coloring each other's toes with chalk. I guess that is what we call a toddler's girlfriend pedicure. Amelia downed about 5 popsicles per day. She even wanted one for breakfast. When Alison came over to make the dresses yesterday we sent the kids outside with popsicles. Mostly, they hovered by the door! Amelia lost a battle with the crib when she bit her lip after crashing into the side of the crib. A popsicle was the cure. Lastly, my new washer and dryer finally came! Sears came and delivered them on Tuesday. Unfortunately, the washer connection was leaking, rather spraying, water whenever turned on. We had to look at our pretty appliances and not do any of the piled laundry. A plumber came over yesterday and put a temporary clamp to reduce the leakage. Next week he will need to rip out the dry wall and replace the innards. I love how they say hello when turned on. It was heaven to do laundry in my own home. I did 6 loads of laundry in only 3 loads. That makes me VERY happy. Lastly, lastly, I am getting frustrated with the whole Utah house not selling situation. The home I really want here is about to list with a real estate agent. The sellers contacted us yesterday, offering an even lower price. If listed with an agent the price will increase. I am feeling reckless enough to want to refinance our town home and use the extra as a down payment, buy the house, then hope our home sells before we have to rent it out. Instead we lowered the price again. I am done with this whole situation. I want to be in a house we can call home, have my stuff back, and prepare for this baby. If there were a proverbial end of the rope, then I am there. We are still looking at houses because most likely my favorite will sell soon. Just let me cry a bit!! I've been a busy, busy bee this week. I cranked out an outfit and three shirts for two local ladies Monday and Tuesday. Since my craft area was a complete mess I kept on going. Alison and I found the cute polka dotted material at Hobby Lobby. We made the girls matching dresses on Wednesday. Don't you love the huge ric rac? I do! 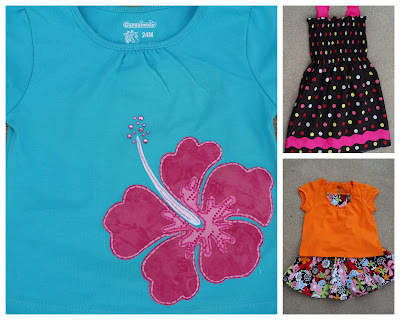 Alison made a hibiscus shirt last week. As promised I made one too. Hers is a bit cuter due to a brown shirt, but this blue one is way too fun as well. I made my first ruffled skirt today. It was not as hard as my mind made it out to be. All I had to do was adjust the stitch length and sew a loose stitch across the top of the ruffled part, then pull the bobbin thread to gather the ruffle. The shirt was a problem! I wanted something simple but matchey since the fabric is so busy. My solution? I ripped out the bib of the shirt, added the fabric (which I gathered with elastic to create a gathered effect), and sewed the bib back on! I am tired! 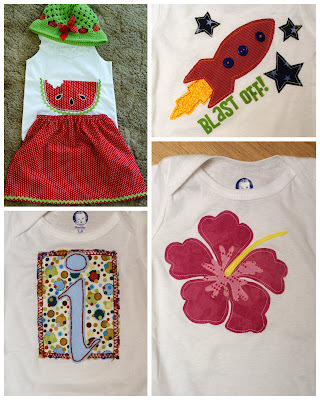 One more outfit to go...I am so excited to finally get to my apples and pear fabric. Maybe tomorrow my craft area will get some much needed cleaning. Yesterday was the warmest day we've had all year at 80 degrees. I filled up the pool in anticipation of an afternoon dip. We spent the whole morning at the park. Amelia played in the dirt while I embroidered a onesie for a customer. We both got farmer tans!! She actually played in the pool water for 20 minutes before her nap! Clouds started to roll in right after her nap, threatening to thunder and rain. It never did but still it was cooler than the previous hour. So what did we do?? 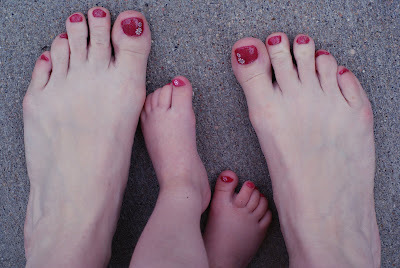 We painted our toenails! Afterwards the sky looked a little better so I put Amelia's swim suit on to swim. 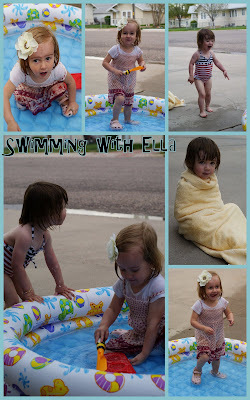 Ella came over to play and ended up getting in the pool with her clothes on! Ella was hilarious! She was so proud of herself for getting wet. In contrast, today was really windy. Alison and I went to the fabric and "craft" store this morning. I found a really cute fat quarters set. 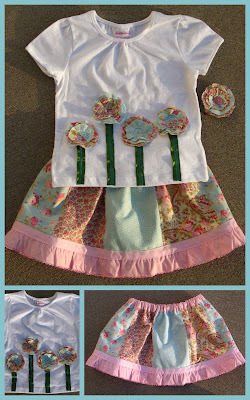 Right after lunch I sewed up a skirt and then cut out flowers for a shirt. Justin corraled Amelia for a while so I could finish the skirt and shirt. The whole ensemble turned out so cute!! I can't wait to make another. It even has a matching fabric flower. 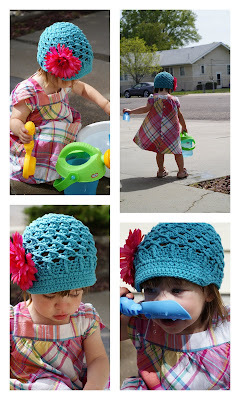 The idea for the fabric flower came from Violet Grace (and Jessica) check out their blogs for fun crafting ideas. We took Amelia outside yesterday after the rain. 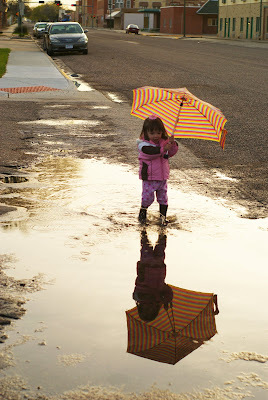 She was dancing in the puddles with the glee of a two-year old!! LOL! My heart was dancing right along with her. She insisted on carrying my 'brella. Her outfit made me laugh, snuggly jammies, black rubber boots, a coat, and umbrella. 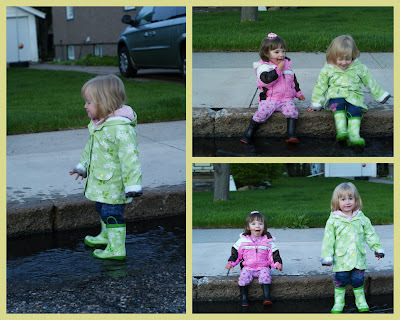 Her journey took us to Ella's house, Ella came out to play in her super cute green flower jacket and boots. Both girls took to scooping dirty water and ingesting it much to their delight. I kept saying, "Mia that water is yucky/gross" to which she replied, "no, isa yummy!" What a cheeky monkey. I love watching Amelia and Ella play now. They are starting to interact better and not fight all the time. Alison let me cut some lilacs off her bush in the alley. The flowers smell soooooooooo good! The flowers are sitting in a Mason jar on my table with a purty purple bow around them. How delicious is spring!! Today was hopefully my last trip to the laundromat. We did 5 loads of laundry, phew! Amelia and I always walk to the library while the clothes are drying. The library has a fun toy corner filled with educational toys like blocks, puzzles, and peg toys. She played for 40 minutes without batting an eye. We had the Elders over for dinner of Hawiian Haystacks and key lime cheesecake. All in all it was a fun day. I appreciate my mom so much! She is A-mazing! I am in utter awe of her ability to bear and raise 8 wonderful children. Even with only one child I am not sure how my mother survived. This year we celebrate Mother's Day with my Mom living in Amman Jordan. Last year she was in Washington DC. Giving gifts and things never seemed much of a focus in our family. I excused myself from Gospel Doctrine to call her before the time got too late to wish my mom a Happy Mother's Day. What an honor to have an elect lady to follow and emulate. This year Justin honored me by getting me a washer and dryer. That is a perfect gift! We have our little Amelia and a baby on the way. Both are a blessing to me already. In church today I felt the spirit a couple of time very strongly. 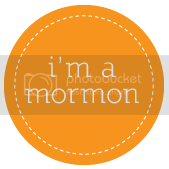 Once when I related my experience at the Madrid Temple dedication and during the RS lesson. The spirit testified of the importance of temples and unity, which are so important on Mother's Day. We can be eternal mothers because of our temple blessings and through our actions as mother's we can unify our families against the wiles of Satan. 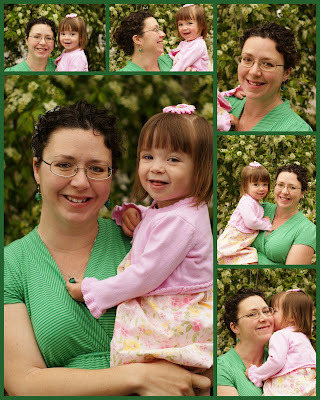 I love getting pictures taken of Amelia and I! It is rare occurrence, so treasured when the chance comes up. Justin took a couple this morning and Alison came over this afternoon and took a couple more. We had a rainy day which made for a rich backdrop against our blooming tree. It smells magnificent and looks deliciously similar to a popcorn tree. Hooray for cute green dresses and a fun day.